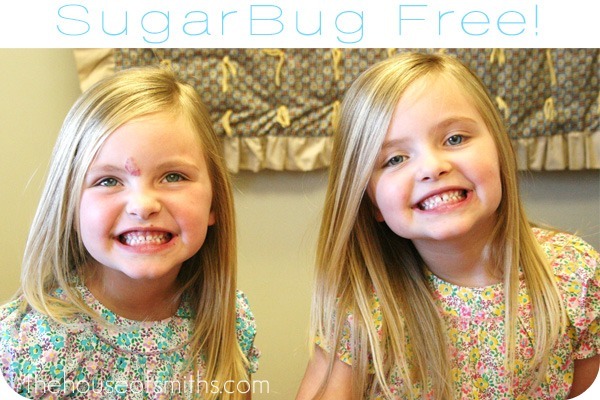 Is it strange that my girls get more excited to go to the dentist, to find out if they are "sugar bug free"... then they do about going to school, or the park? ha! I actually can't tell them we've got an appointment, until THE DAY we go, or I get asked a BILLION times..."Are we going today Mom?... How about now? Is it time yet, to see Dr. Stewart?" "Mom!? I was so good at da Doc'ta's today! He just loves ta gimmie cl'een teef all da time, and I wasn't even sick!" lol. Oh gosh... she kills me...such a ham. I know I've said this before... but Dr. Stewart really is so great. His staff is excellent, and unlike ME, they don't get overwhelmed with kids peeking over their shoulders, wondering about EVERY move they are making. lol. They are super patient and my kids always have the best experiences there, even when they've had to get cavities filled. Hope everyone had a fabulous Thursday! Little Peoples Dental website and blog. Can I tell you a secret? I love going to my dentist too! He is such a good dentist that I didn't when I was your little one's ages. He's also easy on the eyes and in my dream land, I could totally be his wife. So cute and sweet! They have your smile! Our kids love the pediatric dentist too, and they are so good there. But I gotta tell ya, we PAY for that difference. The cost is twice as much as my dentist! Oh how I wish my son was the same way as your daughters. And nothing horrible has even happened to him at his dentist. Just those annoying x rays (and lets face it, even when adults get them it's uncomfortable). Yes, in my future I see further visits with my son wrapped securely in a papoose. Screaming. So I guess I'm be doing the sedation dentisty with him. Joy. I had no idea you were suppossed to bring them so young either! Its good to know that it is possible to have a good experience at the dentist with little ones!